As the name suggests, QuickQuote is a software that can quickly give you an accurate quote specifically for mould making. 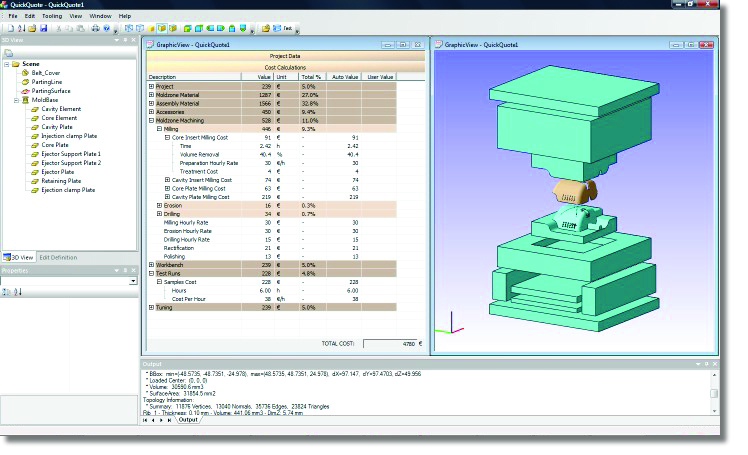 The software has an extensive data base to intelligently calculate an appropriate price based on any size and any variation (small moulds to 35 ton big moulds). The software applies to a diverse range of industries: automotive, aerospace, medical, packaging and more. These industries are extremely time-sensitive. A software that can save you time, is an invaluable trait. Using QuickQuote is an easy and seamless experience. How do we get a fast quote? Depending on the complexity of the part, a quote can be determined in under an hour. 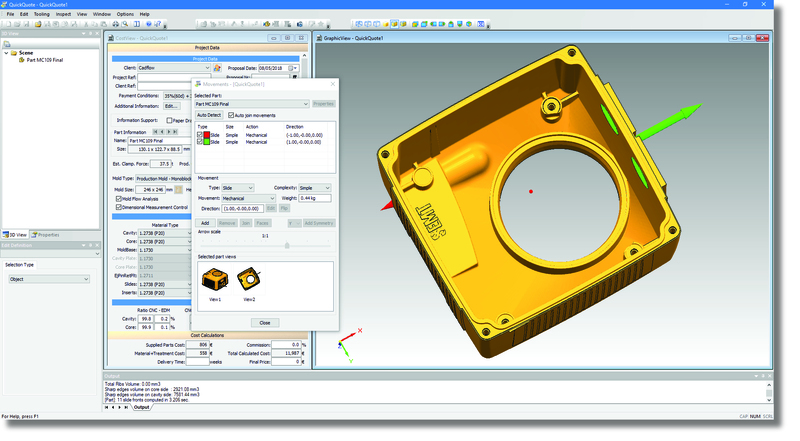 It starts with choosing a 3D model of the part. 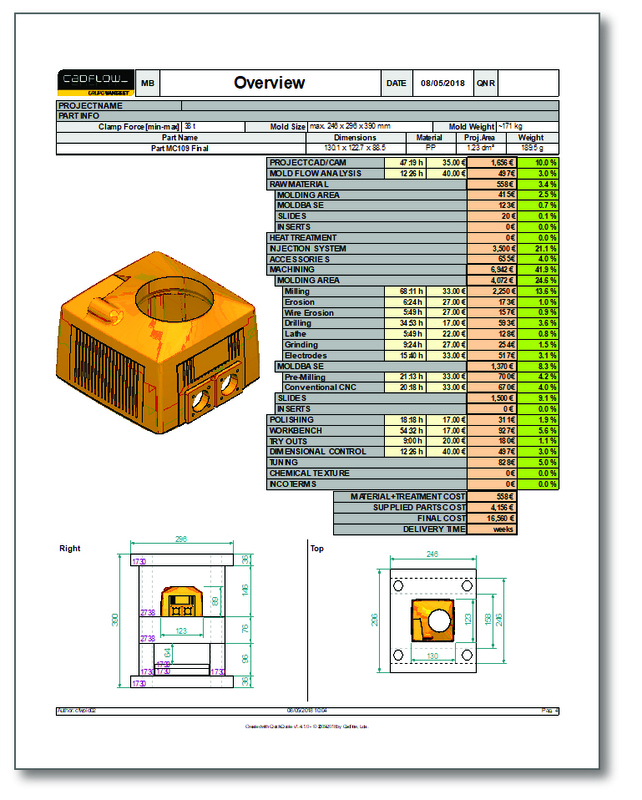 QuickQuote also lets you import part geometry specifications into STL format. The universal and simple format ensures that the information from the customer is easily and accurately entered into the software. After setting the initial parameters, a value is instantly calculated based on the part’s characteristics and user-defined preferences. Any change to the parameters will result in an immediate update of the final value. This allows quick analysis of different variations of the mould design and lets you see how the final cost is affected with each change. It’s really that easy! 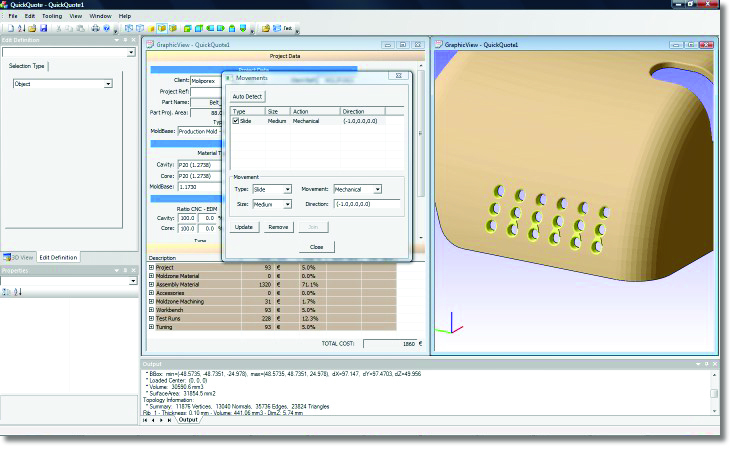 Aside from giving a price for mould making, the software provides many other valuable features. 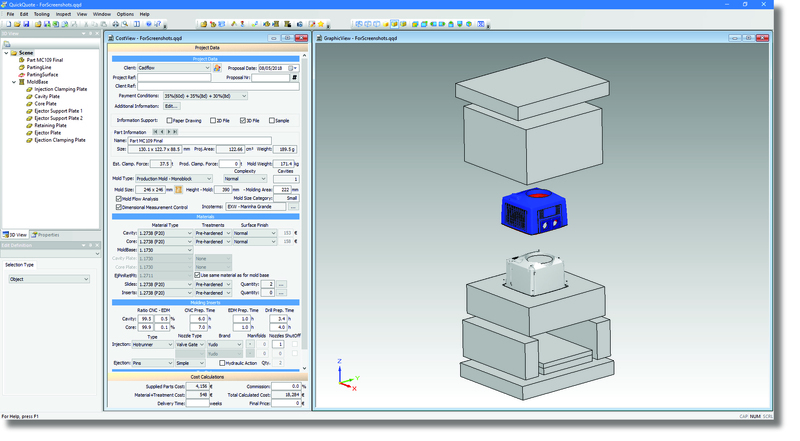 QuickQuote automatically produces preliminary drawings of the mould showing the movable elements. With an accurate depiction of design, it is easy to assess the work ahead and to make planning easier and more efficient with estimated labor hours and itemized costing. QuickQuote archives all quotes so they can be used as future references. This saves time if a similar tool is being made. One of the biggest attributes of the software is its ability for customization. The software can be adapted for any company size and comes pre-installed with average material costs and average hourly costs based on the mould making industry of the specific country. Getting started is very easy. Budgeting and order forms can be adapted to QuickQuote’s automated documentation with minimal effort. 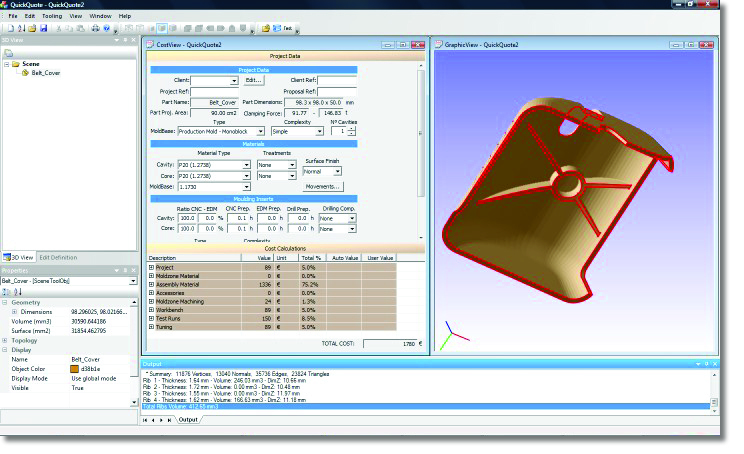 QuickQuote software is a necessity for mould making for many reasons. Above all, it saves time and simplifies the quoting process. It brings organization and makes the work more practical and efficient. A demo of the software can be arranged by contacting our company CADFLOW.